There are easy ways to improve the curb appeal of your home without spending a lot of money. Simply cleaning the outside of your home will drastically improve the overall appearance. All you need is a bucket of hot, soapy water and some elbow grease. Washing the outside of your windows with some hot, soapy water and a squeegee will strip off all of the filmy residue left from falling leaves, bug splatter, and pollen that have accumulated throughout the year. Once the windows are clean, rinse them thoroughly with water and wipe them dry with the squeegee. Your windows will sparkle, adding plenty of curb appeal to your home. If you need to get up on a ladder to reach some windows, be sure to have someone to hold the ladder and spot you. The window screens will need a good scrubbing too. However, you want to wash them gently to prevent tearing the delicate screen. A soft cloth dipped in hot soapy water will do the trick to get loose leaves, pine needles, or bugs off of the screen. Rinse them off with a hose set on ‘spray’, not ‘stream’. Remember, window screens are fragile and will rip and tear easily. If the wind or storms have damaged your screens, replace them. Torn screens are an eyesore and will ruin the effort of your hard work in cleaning the outside of your home. When you have out the bucket and the hose, don’t forget your doors and shutters. The front door of a home is usually a busy place. Lots of handprints and smudges occur over time. Sometimes you have to use your foot to push the door open when your hands are full. Footprints, greasy fingerprints, and dirt can all detract from the beauty of your home’s exterior. Hot soapy water and a soft cloth are all you need to get the door, the shutters and even porch columns looking nice and clean again. You may find that winter was hard on your foundation. Brick, block, or cement foundations can look rough after a long winter of rain, snow, and ice. Mud has probably splashed onto the foundation, leaving it looking dirty and unkempt. 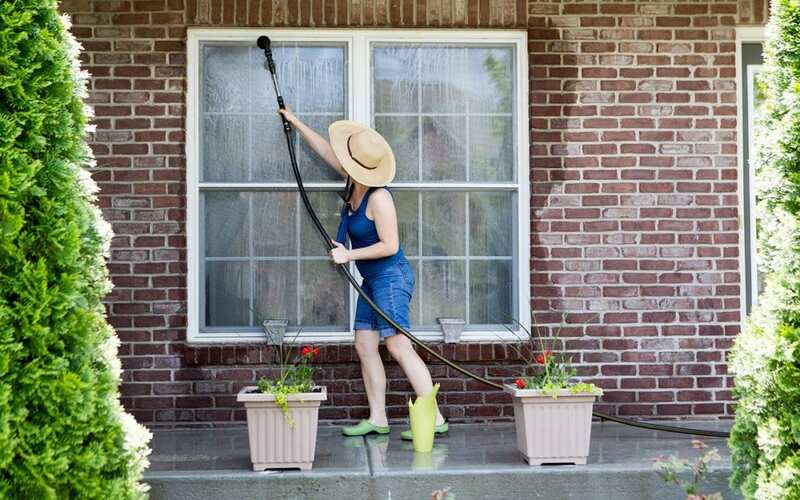 Cleaning the outside of your home will have the most impact if you clean the foundation, too. However, this is not a job you want to tackle with soap and water. Instead, call a professional to pressure wash your foundation. This will remove stubborn mud and dirt that has caked on or stained the foundation of your home. Since you’ve called a professional to pressure wash the foundation, why not go ahead and get the deck, patio, and siding, too? The high-powered spray will strip away grime and pollen, renewing the look of your wood or cement. The results are astounding. When you’re cleaning the outside of your home it makes perfect sense to get the outdoor living areas cleaned, too. After all, summer is about grilling, spending time outside, and enjoying the sunshine. Cleaning the outside of your home may take a whole weekend but the results will be long-lasting and well worth the effort. Home Guard Inspections provides home inspections and light commercial building inspections in the Bismarck-Mandan area. Contact us to schedule any of our services today.